FILE PHOTO: Student leaders Lester Shum, Alex Chow, Joshua Wong and Nathan Law hold hands as they walk into the High Court to face verdict on charges relating to the 2014 pro-democracy Umbrella Movement, also known as Occupy Central protests, in Hong Kong, China August 17, 2017. HONG KONG - The jailing of three Hong Kong democracy activists this year is a serious threat to the city’s rule of law, a group of senior international lawyers said on Monday, adding the independence of the judiciary risks becoming a “charade”. 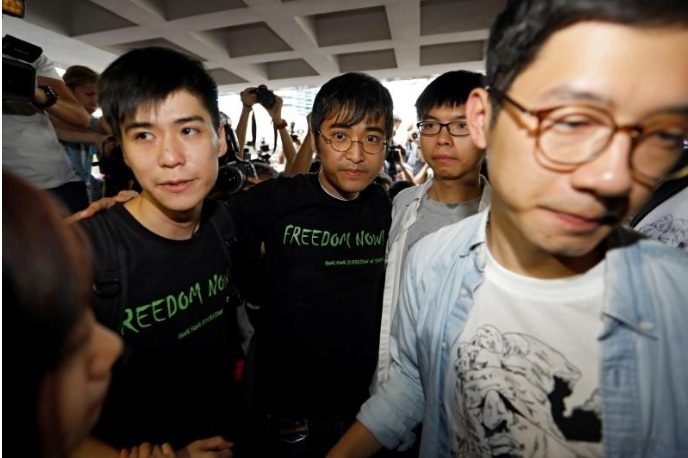 Joshua Wong, Alex Chow and Nathan Law were sentenced to community service last year for unlawful assembly but were dealt harsher punishments of jail in August after a government appeal. Hong Kong, a former British colony, returned to Chinese rule in 1997 under a “one country, two systems” formula that promises it a high degree of autonomy and freedoms not enjoyed on the mainland, including an independent judiciary. In an open letter, 12 lawyers including former lord chancellor Charles Falconer criticized the imprisonment of the trio, who were among the leaders of the democracy protests in late 2014 that drew hundreds of thousands at their peak. “The independence of the judiciary, a pillar of Hong Kong, risks becoming a charade, at the beck and call of the Chinese Communist Party,” the lawyers said. They described the 2014 democracy demonstrations as “one of the most peaceful public protests the world has seen”. A series of court cases against about 100 young democracy activists has, however, shaken confidence in the city’s vaunted rule of law and critics fear a watering down of its freedoms and creeping interference by Communist Party rulers in Beijing. The lawyers’ letter comes amid heightened criticism of mainland Chinese authorities over what some Hong Kong and international observers see as increased meddling by Beijing in the former British colony’s affairs. Among the letter’s signatories were Geoffrey Nice, former chief prosecutor in the trial of Serbia’s Slobodan Milosevic, human rights lawyer Jared Genser who represented Chinese dissident Liu Xiaobo and Kirsty Brimelow, chairwoman of the Bar Human Rights Committee of England and Wales. The letter comes days after British activist Benedict Rogers, who has been critical of Hong Kong’s rights record, was barred entry to the territory, prompting demands for an explanation from British Foreign Secretary Boris Johnson. Hong Kong has, on occasion, barred entry to dissidents, including former leaders of the 1989 Tiananmen Square protests in Beijing and a Dutch sculptor who made a Tiananmen sculpture, though other Tiananmen activists have been allowed in for short visits. China said after Benedict was denied entry that it had the right to bar people from Hong Kong and that it had complained to Britain after it demanded an explanation. The jailing of three Hong Kong democracy activists this year is a serious threat to the city’s rule of law, a group of senior international lawyers said on Monday, adding the independence of the judiciary risks becoming a “charade”.